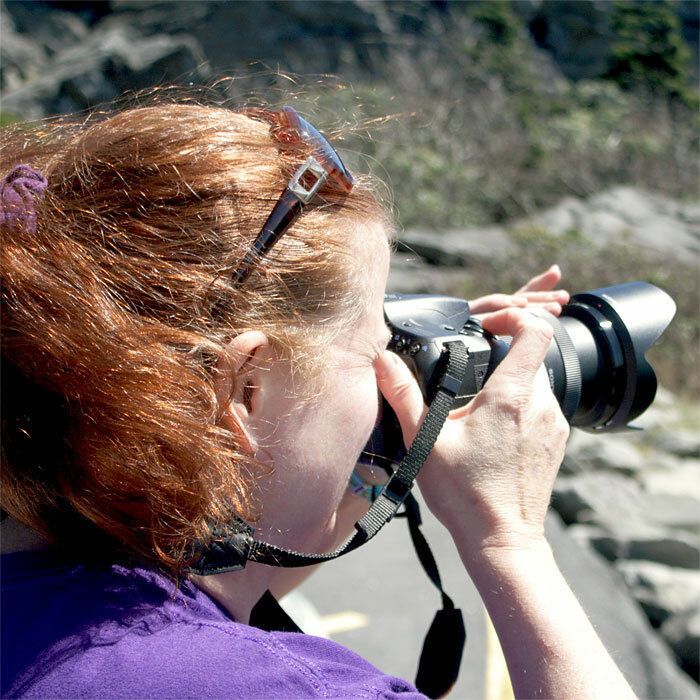 Meta Gätschenberger is an Award Winning Photographer from Blowing Rock, NC, in the beautiful Blue Ridge Mountains of the Western North Carolina High Country. Meta Gätschenberger is a Professional Commercial Photographer, specializing in Natural Looking HDR Photography, High Dynamic Range Photography, Commercial Photography, Nature Photography and Macro Photography. Meta’s North Carolina Nature Photography Photos are For Sale Online at Photos by Meta and in Downtown Blowing Rock, NC at Rustic. Photos By Meta – Meta’s Nature Photography Goes Live! 2017 was an exciting first year for Blowing Rock North Carolina Nature Photographer, Meta Gätschenberger. Photos By Meta, Meta’s North Carolina Nature Photography Gallery, went live! 2017 started off having Meta’s “Orange Fireworks” be selected by the Town of Blowing Rock for their Official 2017 Tourism Calendar, which are free from the Blowing Rock Chamber. Next was having Meta’s “Painted Trillium” win 1st place at the 2017 Grandfather Mountain Nature Photography Contest! Meta’s “Boone Fork Stream” was the 2019 November Winner in the Ray’s Weather Blue Ridge Parkway 2019 Calendar out of over 720 entries. Meta’s “Boone Fork Stream” was also the 1st Place Winner in the 2018 ARHS Benefits Book Cover Contest. This Employee Benefits Booklet goes out to all Appalachian Regional Healthcare System Employees. Meta’s “Boone Fork Stream” Framed Photograph is available For Sale at Rustic, 915 Main Street in Downtown Blowing Rock, NC. Meta’s Western North Carolina Nature Photography Prints are available For Sale Online at Photos by Meta. Photos are also available on T-Shirts, Greeting Cards, Coffee Mugs, Tote Bags, Beach Towels, iPhone Cases and Other Interesting Items! Meta’s “Blue Ridge Parkway Viaduct” is on display in the U.S. Post Office Lobby, in downtown Blowing Rock, North Carolina. You can purchase this Blue Ridge Parkway popular photo, and other landscape framed prints a few doors down, at Rustic on Main Street. Meta’s “Painted Trillium” won 1st Place in the Wild Flower Category in the 2017 Grandfather Mountain Nature Photography Weekend Contest. The “Painted Trillium” is on display at Grandfather Mountain in the Main Lobby next to the Nature Museum, and will remain on the wall until 2020! Photos by Meta is a member of the Blowing Rock Chamber of Commerce, which promotes local Blowing Rock businesses and Western North Carolina High Country Travel and Tourism in the small Village of Blowing Rock, NC. 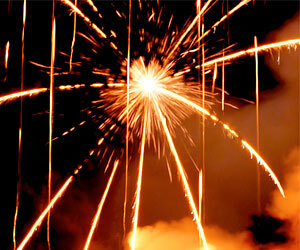 Meta’s “Orange Fireworks” was selected by the Town of Blowing Rock to be featured on their Official 2017 Blowing Rock, North Carolina Visitor’s Calendar. This Official Calendar features many other Blowing Rock NC Photographers. The 2017 Official Town of Blowing Rock Calendars are available free of charge from the Blowing Rock Chamber of Commerce and the Blowing Rock Town Hall. 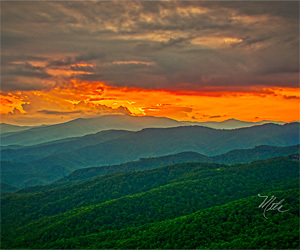 Photos by Meta North Carolina Nature Photography Framed Prints – 13”x19” Framed Prints are for sale at Rustic on Main Street, in downtown Blowing Rock, NC. Four Photos by Meta are on display at The Paul H. Broyhill Wellness Center, in Boone, NC, in the upstairs Running Track Area. Meta’s “Boone Fork Stream” won 1st Place in the ARHS Benefits Book Cover Contest. This Employee Benefits Booklet goes out to all Appalachian Regional Healthcare System Employees in 2018! Meta’s “Boone Fork Stream” was the 2019 November Winner in the Ray’s Weather Calendar. This popular Calendar features Photographs of the Blue Ridge Parkway in North Carolina and Virginia! A portion of proceeds from the calendar sales will be donated to the Blue Ridge Parkway Foundation, of which Meta is also a member. Meta’s “Moss Spores” got Honorable Mention at the 2018 Grandfather Mountain Nature Photography Weekend. 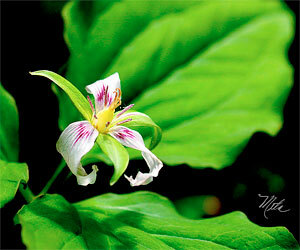 In 2017, Meta’s “Painted Trillium” won 1st Place in the Wild Flower Category. This years Grandfather Mountain Nature Photography Weekend’s weather on the Mile High Grandfather Mountain didn’t cooperate very well. It was very windy (50 mph+), very cold with rain and fog! Welcome to the Blue Ridge Mountains of Western North Carolina! Nineteen Photos By Meta are on permanent display at the Watauga Medical Center, in Boone NC. (3rd Floor Secure Hallway – Sorry, Hospital Employees Only). Meta’s “The Blowing Rock” was selected by the Town of Blowing Rock to be featured on their Official 2019 Blowing Rock, North Carolina Visitor’s Calendar. 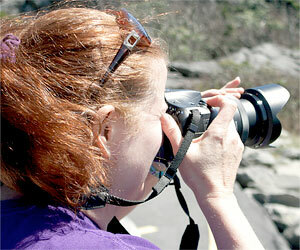 This Official Town Calendar features many other Blowing Rock NC Photographers. Meta’s “Boone Fork Stream” appears for the Month of November 2019 on Ray’s Weather Blue Ridge Parkway 2019 Calendar. Meta’s “Blowing Rock Sunset” will appear in the Blowing Rock Visitors Guide and Members Directory for 2019–2020. This amazing sunset over Grandfather Mountain, was shot in HDR, using 5 bracketed shots, from The Blowing Rock, in Blowing Rock, NC.